Parents push education because education seems to equate with success. Not necessarily true. High IQ and Street Smarts help, but more is needed. IQ, EQ, EI, and now F = T tau St. What’s that? “Intelligence is a force that acts to maximize future freedom of action.” Here’s a research based Ted talk on this newest definition of intelligence. If one surveys the world of today and the advancement of various civilizations freedom of action seems part of the mix determining forward progress. Rigid holding to sacred texts or past beliefs limits learning, particularly future based learning. Two other factors play a part. The first is age and stage. The infant reacts on instinct. As the toddler moves toward school readiness, she has developed what some call a theory of mind. Theory of mind refers to our understanding that other people’s thoughts and wants are not the same as outs. However, much of a child’s thinking at this point is controlled by her wants and desires. This stage has been dubbed “Magical thinking by many. This is the age of the tooth fairy, toys that are alive, ghosts and monsters lurking here and there. As school is entered upon the child’s thinking becomes reality based, but only as related to what he can see or touch or actually manipulate. Concrete thinkers do not think about many options and mostly are “Either/Or” thinkers; Critical thinkers think “Yes/And” which is the heart of critical thinking. Tip one: Encourage free play. Lots of free play. Join your children in their free play games. Tip two: Broaden the preschooler’s theory of mind by teaching good manners based on consideration of others. Tip three: Push a bit beyond age and stage. During the years of magical thinking this can be done quite easily. How? Just name make believe as make believe or play. Don’t worry about destroying the magic of this age, you cannot. Don’t agree, label what is according to reality and you are preparing the child for the next stage. When the child gives up magical thinking, acknowledge the new skill and beginning pushing thinking more broadly. The easiest way is to every once in a while add the word “and” followed by a question mark to sentences that seem to take an “either/or” position. If the child cannot come up with something, add one for him. When the teen starts challenging your thoughts and beliefs, that is a sign she is thinking critically. That’s when the use of the “And?” comes into its own. Suggesting “do-overs” forces thinking more critically about what was done and what could be. Tip Five: Use the media to reinforce all of the above. Today’s parents are beset with too much pressure and too much advice. It helps to remember what matters, to practice kindness, but also to laugh and play. Laugh and play with your kids, but always have some just for you fun time. Even a half an hour a day improves the quality of any parent’s life. You and your children will benefit from such times. Both of you will also benefit from learning to create a safe place in your mind. That is what today’s Free Poster Coach is all about. 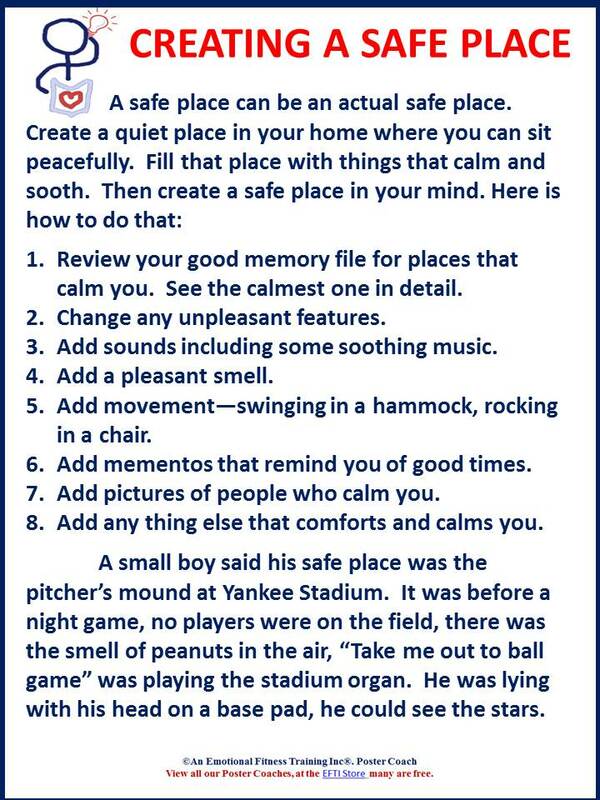 Today’s Free poster coach details how to create a safe place. Safe places combine with the OMM provide a brief get away from stress, a mini-vacation. Creating and using a safe place is a self-soothing exercise. Here is how to create your safe place. Go to the EFTI store to claim free copy of this or any of our other free Poster Coach. The posters should be printed up in color on card stock and posted where they will remind you what matters or to practice an Emotional fitness skill. Finally, Thank you for all you do. I am particularly grateful to those who practice internet kindness by liking, rating, commenting, or sharing my posts. This entry was posted in Parenting Issues and tagged adoptive parents, children, Emotional fitness, Emotional Health, help for parents, Katherine Gordy Levine, parenting, Parenting advice, parenting tips, Shame, Thinking about what matters. Bookmark the permalink.